Congratulations to Mr. T-Thawat (Pete) Taifayongvichit, Class of 2015! 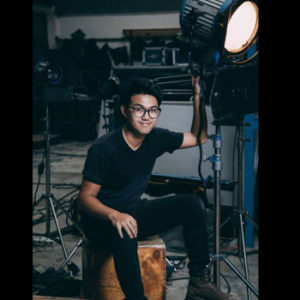 His script, “Pencil, Money, Whatever, Microphone” was selected for short film production at the Asian Film Academy (AFA) 2017. The film that will be produced based on his script will be screened at the Busan International Film Festival 2017. Mr. T-Thawat earlier was given the White Elephant Award (Best College Film) at the Thai Short Film and Video Festival 2016. The AFA is an educational program hosted by Busan International Film Festival and Busan Film Commission to support young Asian talents and help build their networks throughout Asia. Every year AFA selects 24 candidates throughout Asia to attend its free 18-day workshop. Earlier, his short film “Soi Soonvijai 14” was selected for screening at Busan International Short Film Festival (BISFF) 2017 and also included in the Little Wing Film Festival in London this year.